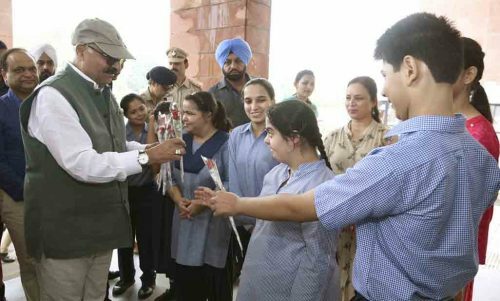 Chandigarh, September 10, 2018: The Governor of Punjab and Administrator UT, Chandigarh visited at Government Rehabilitation Institute for Intellectual Disabilities (GRIID), Sector-31, Chandigarh today. The Administrator was apprised of the problems being faced by the institute and he also interacted with parents. The Administrator desired that we should invite the Ambassadors of disabled friendly countries and these ambassadors can also be requested to depute the field experts from their respective countries. Such Exchange program will help us to make the city Disabled friendly. These include Berlin – Germany, Barcelona- Spain, Ljubljana – Slovenia, Sydney – Australia and San Diego – USA. Prof. B.S. Chavan, Director, GRIID informed the Administrator that the pace of construction for the remaining component of GRIID i.e. auditorium, vocational block and hostel for trainees and special children is very slow and many of them are yet to be started. The parents were worried that what will happen after them as there is no facility for the persons with disabilities after 25 years in GRIID. Majority of the special children coming to GRIID are from economically weaker section and they are getting difficulties in getting accommodation as their children may have behavioural problems of their children. The UT Administrator desired that and international conference should be organised by GRIID where of the various stake holder can come together to make Chandigarh the best city in the country in the field of disability. The Administrator asked the Director, GRIID to organise the meeting where all the difficulties and the vision to make the Chandigarh disabled friendly city in the country and bring it on the world Map can be discussed.